A Queen's Emeritus Professor – Dr Phil Scraton – who played a seminal role in getting to the truth of the 1989 Hillsborough disaster which claimed 96 lives, received a standing ovation at the BAFTAs when he joined the team behind the documentary, 'Hillsborough', as they collected the 'best single documentary' award. 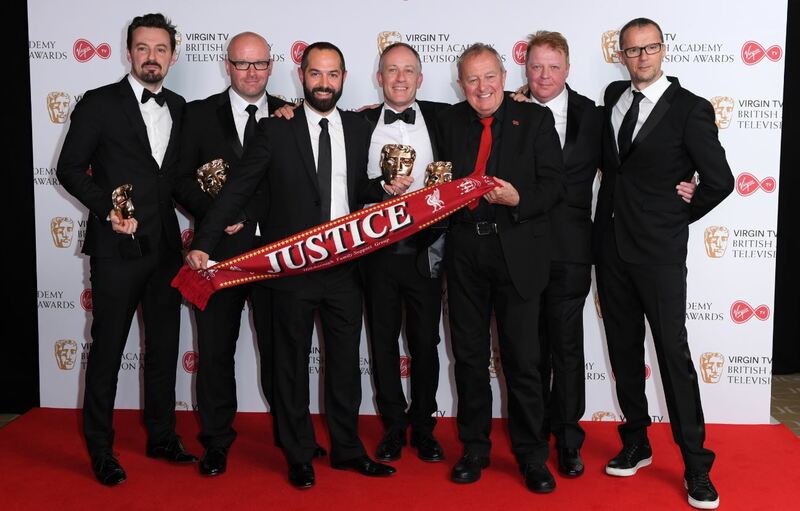 In his acceptance speech, the documentary's director, Daniel Gordon (pictured third from left), paid special tribute to Professor Scraton, who wore a Hillsborough Family Support Group football scarf around his neck, thanking him for working ‘so tirelessly, diligently’...and 'with dogged determination to expose the full truth of Hillsborough’. The main author of the Hillsborough Independent Panel’s 395-page report into the tragedy – who was the film’s factual consultant – was visibly moved to tears as the production team picked up the award at the glittering Virgin TV British Academy Television Awards ceremony on Sunday evening (14 May). Speaking exclusively to Queen's, Dr Scraton said: "Winning the Best Documentary BAFTA for Hillsborough was a tremendous tribute to the outstanding work of Dan Gordon and all at verymuchso productions. It follows an EMMY nomination and the Broadcasters and Writers Guild award." "As Factual Consultant and contributor to the film the challenge was to ensure that the detail of my book, Hillsborough: The Truth, developed over 27 years, my work on the Hillsborough Independent Panel and as consultant to the legal teams at the recent inquests, was not compromised by the brevity of a two-hour film. It wasn't." The two-hour documentary film, previously nominated for an EMMY, featured interviews with the families, police officers and survivors. It was embargoed until the inquest reported, was updated and premiered in Sheffield and Liverpool cinemas ahead of its broadcast on BBC Two following the landmark verdict in 2016. "The film stands as a fitting tribute to the tireless campaigning and tenacity of the bereaved Hillsborough families and the many survivors whose lives were changed for ever on that beautiful spring afternoon, 15th April 1989," added Dr Scraton. "It also demonstrates the significance and potential of critical academic research, working with diverse media, to bring about tangible social, legal and political change. In part this is the responsibility of research-led universities." The campaign to clear the names of the 96 Liverpool fans who perished at Hillsborough Stadium, Sheffield on 15 April 1989, was greatly informed and shaped by Professor Scraton who was legal consultant throughout the second inquests into the deaths. The inquests were in session for over two years and on 26 April 2016 the jury determined that the 96 people who died were unlawfully killed, marking a major milestone in the bereaved families’ journey for justice. The jury verdict heavily criticised the South Yorkshire Police, the Ambulance Service, Sheffield City Council, the stadium owners and thier architects. It exonerated the fans of any blame or responsibility. Phil Scraton's in-depth research into the context, circumstances and aftermath of the Hillsborough disaster includes the publication of two influential reports, published in 1990 and 1995; numerous academic articles; and the much-acclaimed book Hillsborough: The Truth which is widely accepted as a definitive account of the stadium disaster and its aftermath. The full revised edition was published in 2016 and covers the Panel's work and the inquests. In January 2010 Professor Scraton was appointed to the Panel to head its research, based at Queen's. Three years later, as its primary author, he presented the Report's 153 key findings to over 300 bereaved family members at Liverpool's Anglican Cathedral in September 2013. Combining documentary analysis and qualitative research with families and survivors, Phil's work has been publicly recognised an exemplar of methodological innovation, policy relevance and public engagement. It has set new standards for truth recovery, corporate responsibility and institutional accountability. Phil won the inaugural Queen's Vice-Chancellor's Award for research impact in December 2012, and his work was highly commended at the 2013 THES national awards for research. In 2016 he was given the Freedom of the City of Liverpool followed by the Political Studies’ Association’s Campaigner of the Year. He declined an OBE in the New Years Honours. Professor Scraton will deliver the 2017 Eve Saville memorial lecture organised by the Centre for Crime and Justice Studies, next week (Tuesday 23 May) in London. He will draw on his experience investigating the Hillsborough disaster to talk about the role of critical research in securing truth and acknowledgement. This is followed by an invited plenary at the British Criminology Society's annual conference, the Amnesty lecture at the Shetland Film Festival and numerous other guest lectures. In April 2013, Professor Scraton gave a presentation entitled ‘Recovering Truth, Informing Justice’ about his research and findings at a lecture in the Sir William Whitla Hall at Queen’s. A video of his presentation can be viewed here.